5. Pokemon Go Auschwitz: There are Pokestops in Auschwitz. Just in case the whole genocide thing brings you down, you can take a break with some cute critters! 4. Holocaust-themed Lego: Here’s someone who made a movie about a concentration camp, with Lego! Then there’s the artist, Zbigniew Libera who entered a Lego contest by creating a Lego Concentration Camp (Konzentrationslager), complete with starving Lego figures, guard towers, and body parts. Some felt this was trivializing the Holocaust, but to be fair to the artist, he was making a statement, perhaps one that was critical of the trivialization or commercialization of the Holocaust. He has not elaborated so it’s not possible to say. 3. 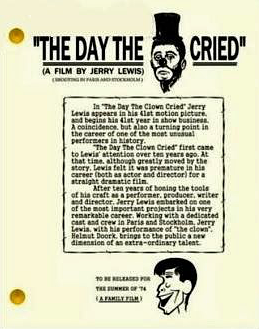 The Day the Clown Cried: This is an infamous film by Jerry Lewis about a Jewish clown who ends up imprisoned in a concentration camp, where he entertains children all the way until they are at the doors of the gas chambers. The film has never been screened, but is notoriously awful and a failure. Lewis agrees, which is why he has not shown it. Click here for more clips of the movie. 2. For Such a Time: A book by a Christian author named Kate Breslin about a romance between a Jewish resident of a concentration camp who falls in love with a guard and then converts to Christianity, the book was enthusiastically received by the evangelical Christian audience it was written for, but criticized by many Jews for its offensive cultural appropriation of both the Holocaust and the Biblical Story of Esther. 1. The wife of Vladimir Putin’s spokesman (Dmitry Peskov) is a gold-medal winning Olympic ice dancer named Tatiana Navka. She and her ice dancing partner just performed a Holocaust-themed figure skating spectacular: It . . . well . . . it doesn’t go well. It’s worth pointing out that Holocaust-themed figure skating has been done, and more tastefully, in the past. For example, Yulia Lipnitskaia performed at the Sochi Olympics to the theme from Schindler’s List, wearing a figure skating outfit designed to resemble the red coat worn by a doomed Jewish child in the film. In addition, German Katarina Witt danced in the 1994 Olympics to the theme from Schindler’s List (a year after the film came out), and the performance was praised by Stephen Spielberg. Both of those performances also had their critics.